What a great start to the sale. Today was a wonderful first day of the sale with quite a few, very large 'save piles'. We started with a long line of people, all waiting patiently until admittance at 8am and when we let people in they worked in harmony (a kumbaya moment) allowing most people to get at least some of what they wanted. We opened at 8:30 and I don't think that a single person was ready to leave before 9:30. I understand that there were a couple of hiccups, namely that they stopped allowing people in the front gate periodically, until the street crowding would thin out a bit. Sorry, but that was out of our control and I know that they would start allowing people in again in 15-25 minutes later. It looks as thought the family is allowing us to discount tomorrow so we will be 50% off of everything except fine jewelry and the Eva Zeisel china starting at 8:30. Everyone was very happy and excited with their purchases and it was great seeing everybody. Let us know of any treasures that were extra special. We hope to see everyone and more tomorrow!! A common question that I have received about tomorrows sale is "What time can we line up?" The answer to this question is I don't really know. I have heard from the HOA and guards anywhere from 8:00-8:30 as the time that they will let people in but I know that with previous sales, some customers were able to get in a bit early. I know that it's inconvenient but I'll accept it to be allowed to hold such a fantastic sale behind the gates. So many times communities like this won't even allow sales to be held at all so I am very appreciative of the Bixby Hill Associations willing to work with families and businesses in order to facilitate these necessary (to the families) sales. Please please please remember that we are guests there and obey all rules and be extra courteous to the residents-especially when it comes to noise and parking. We look forward to seeing you! Here is a photo featuring just a portion of the costume jewelry. Also here are a couple of links of tools that I feel are necessary for all customers seeking treasures. Ok, so the HOA has now informed the owners that they only allow two day sales. No worries, we will just have to blow everything out by Saturday afternoon. Please make sure and email us the names of who is coming in your group, don't let this stop you if you forget as I will be giving them a list of regular customers names. This is a great sale so don't miss out. I didn't include the photos of all of the midcentury pots or the plants that are in them but there are lots of those also. Below, there is a link to a very handy UV lamp that one of our customers showed me, it is a great tool to check for repairs on porcelain, to check for repros such as iron banks (modern paint typically glows more under UV), artwork repairs and more. I believe that it is one of the most important items to bring with you. The Bixby Hill Home Owners Association has decided to postpone our sale as the Rancho is having a large event this weekend. Not sure if its sold out but if not you should try and attend as I have heard great things about it. We have applied for the dates Sept 6, 7 and 8. There is so much at this estate that we are going to hold the sale on Thursday, Friday and Saturday. It looks as though we will need you to email us your names to give to the guard gate. 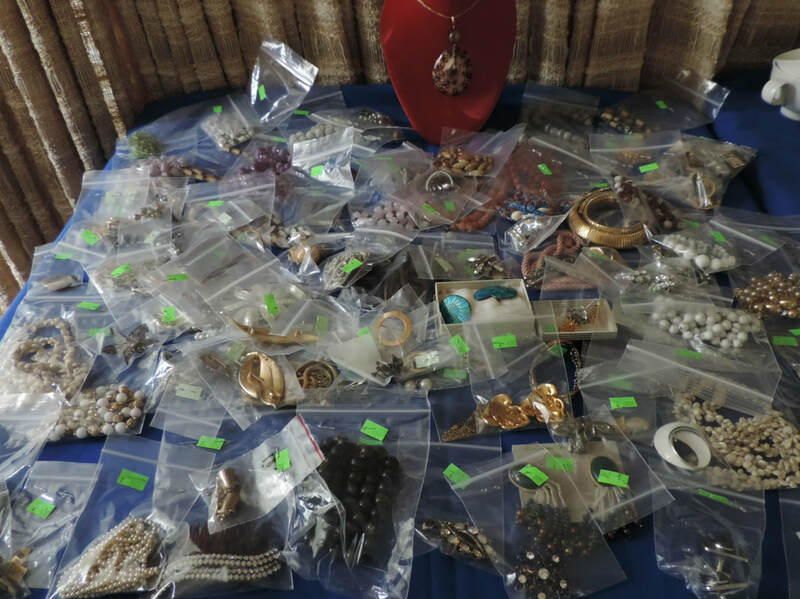 As a reward for our patience, the homeowners have handed over even more of the estate jewelry - truly a win win. Check out the photos but remember that those are just a tip of the iceburg!